Dr. Jane Tiptree (Diane Ladd) is a mad scientist who is supposed to be breeding huge chickens by splicing their DNA with other birds and reptiles, but instead she has taken up the noble task of making them give birth to dinosaurs. Meanwhile, an alcoholic security guard teams up with an ecological activist named, Thrush (Jennifer Runyon), after an escaped dinosaur eats her friends. It turns out that Dr. Tiptree not only wanted chickens to make dinosaurs, but she also has engineered a virus that causes women to give birth to them as well. Just when it seems like things can’t get any worse (they do), the government descends on the town complete with guns, flamethrowers and orders to kill everyone before the contagion can spread any further. Carnosaur is cheap, violent, and lurid. 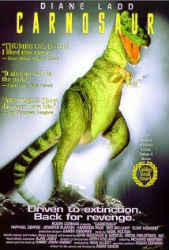 It has all the makings of a great trashy cash-in meant to ride on the popularity of Jurassic Park (1993). The film falls down by forgetting to be enjoyable or engaging, and instead opts to be a depressing slog. Something like this might have played better in the 1970s when eco-horror flirted with utter hopelessness. There are a few moments where Carnosaur works, my favorite scene being when the eco-warriors have handcuffed themselves to some construction equipment to protest when along comes a hungry dinosaur. Then there are scenes that don't work so well, like Diane Ladd giving birth to a baby raptor. Carnosaur goes out of its way to produce a nihilistic end that is mostly cribbed from Night of the Living Dead (1968) except not good.